Charles and Colvard Forever One round brilliant moissanite gemstones offer the sparkle and shine of a brilliant cut stone in a popular round shape. The special facets of these stones are designed to maximize the brilliance and fire of this D-E-F colorless moissanite. Choose from 12 different sizes when you place your order. These range from 6.5 millimeters all the way up to 12 millimeters, depending on your preference. This stone is perfect for any fine jewelry setting and makes an excellent center stone for an engagement ring or pendant. North Carolina-based Charles & Colvard is known for creating the world's most stunning moissanite stone. 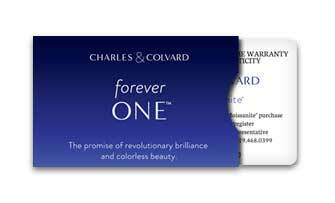 Forever One ™ Moissanite gemstones are magnificently colorless (equivalent to D-F color diamonds). These moissanite stones are typically 10% more brilliant than a diamond and have a hardness of 9.25 on the Mohs scale of hardness, comparable to a diamond's score of 10 (the hardest possible).